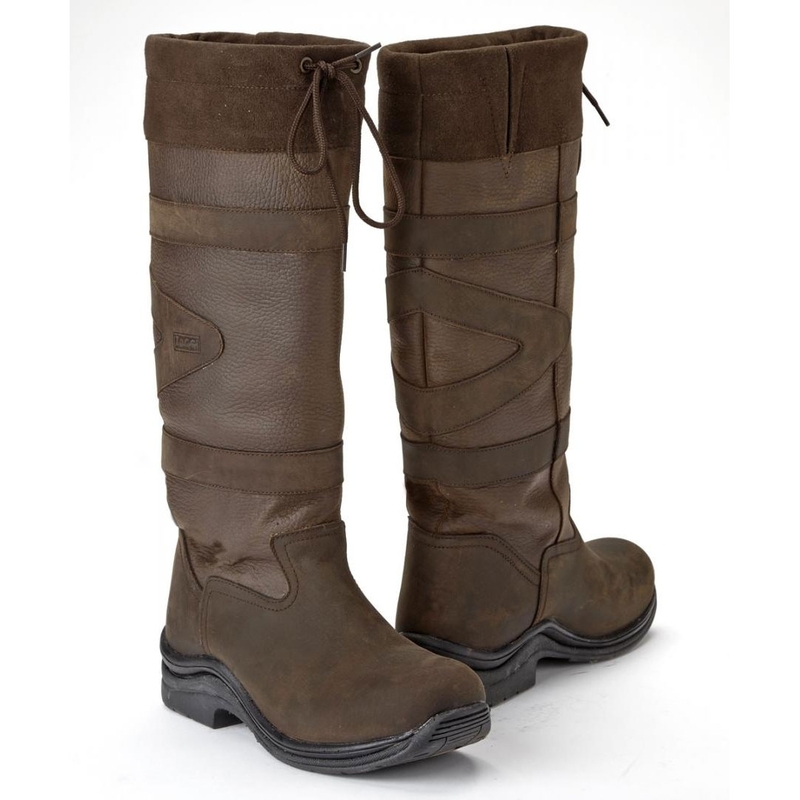 Long milled leather waterproof/breathable boot. Varidex waterproof membrane system. Breathable PU cushioned insock for added comfort. Lightweight flexible PU rubber sole unit. Suitable for riding. Made with a leather upper and PU rubber sole unit. Not had full chance yet to make full comment. Fantastic boots for walkingMy last pair lasted 5 years but have finally split I wear them through mud water snow anything. I have never treated them with anything and I got 5 years of daily wear out of them if this pair last as well I will be very happy.I have to say the first time I wear them each season they cut my heels to pieces but once my heels toughen up they are like slippers you wont be disappointed! My 4h paid of these boots. Absolutely love them. Tough warm and waterproof. Have a 4 year old set still in use. Had to wear a couple of times to break in around the ankle but now super comfy. Keep my feet warm and feet and legs dry just what I needed. Nice style boot too. Lovely warm and comfortable boots. Perfect service love the boots !!! Lovely boots but a little wide for my legs so ordered and different style. Poor service expensive postage to have delivered charge for returns too. Will never use them again and will advise others not to. Cant say much about these as theyre not for me but my wife had had a pair before and loves them! Great boots they look smart and so far are comfortable and waterproof. However I had to order a size smaller than usual as I found the size 5 far too big. Brilliant. So comfy and warm. Like that they are waterproof too. I've had a pair of these boots for approx 4 years and have not been disappointed, they're a bit tight to pull on, but once on they are so comfortable, each time I've worn them my feet have stayed warm and dry, although I wouldn't recommend you walk in ankle deep water for too long as I think they did start to let water in! Worth every penny.